Simon & Schuster, 9781476711713, 288pp. For fans of Deep Work, Great at Work, and the 7 Habits of Highly Effective People, The 5 Choices is an essential guide for understanding productivity and time-management in the 21st century. Every day brings us a crushing wave of demands: a barrage of texts, emails, interruptions, meetings, phone calls, tweets, breaking news—not to mention the high-pressure demands of our jobs—which can be overwhelming and exhausting. The sheer number of distractions can threaten our ability to think clearly, make good decisions, and accomplish what matters most, leaving us worn out and frustrated. 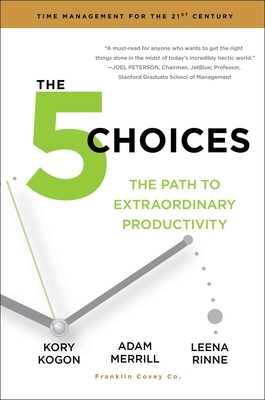 From the business experts at FranklinCovey, The 5 Choices is an exploration of modern productivity. It offers powerful insights drawn from the latest neuroscience research and decades of experience in the time-management field to help you master your attention and energy management. The 5 Choices is time management redefined: through five fundamental choices, it increases the productivity of individuals, teams, and organizations, and empowers individuals to make selective, high-impact choices about where to invest their valuable time, attention, and energy. "As a working mom I have a very full life at home and at work. Staying productive is an extraordinary feat. The 5 Choices: The Path to Extraordinary Productivity brings together some of the best principles of Dr. Stephen Covey with the best thinking of how to better use my time, my technology, and my brain in order to keep my projects, my sanity, and most importantly my most important relationships prioritized. Extraordinary indeed!" — Brandon Wade Anderson, Ph.D., Director, Organization Development & Talent Management, Transamerica, Inc.